"Everything looked as if it had received a coat of fresh paint the day before—the red roofs, the green shutters, the clean, bright browns and buffs of the house fronts … They found themselves face to face with the ocean and with a very picturesque structure, resembling a magnified chalet, which was perched upon a green embank­ment just above it. The house had a veranda of extraordinary width all around it, and a great many doors and windows stand­ing open to the veranda. These various apertures had, in common, such an access­ible, hospitable air, such a breezy flutter within of light curtains, such expansive thresholds and reassuring interiors, that our friends hardly knew which was the regular entrance, and, after hesitating a moment, presented themselves at one of the windows." This will still serve as a composite image of the other seaside resorts from Mount Desert to Atlantic City, but it has quite ceased to be characteristic of the oldest and most famous of all. Another shrewd observer, M. Paul Bourget, in his "Outre Mer," has given the impression of the Newport of the nineties - the impression of an architectural museum, having nothing of the air of a temporary resort, but rather of a "continuing city," reared of monumental material, and above all regardless of expense. Indeed, the French tourist by reason of seeing Newport first was induced to make some rash generalizations about the United States in general, which a wider observation would have shown him would not hold good. They may have been nearly as rash as was, according to Goldsmith, the famous generalization from the experience by a preceding French traveler of his first inn that the landlords of Alsace were all drunken and the land­ladies all red haired. "It is here that this spirit of 'go-ahead' proper to America is recognized in magnifi­cences of building highly significant, when one thinks that these dwellings serve for six weeks or two months of summer, and that they imply a four-horse coach, a yacht - sometimes two, sail and steam - a private car, a house in New York and another in the country. Here is a man who has lived much in England, and it has pleased him to have, on one of the slopes of Rhode Island, an English abbey in the style of Queen Elizabeth. Another loves France, and it has suited him to possess, in view of the Atlantic, a chateau of the French Renaissance. There is the château which recalls to you Azay, Chenonceaux and the Loire, with the clear slow ribbon of its water, wound, unwound, rewound around the black sands of the islets. A third has built a marble palace, like Trianon, with pilasters having Corinthian capitals as large as those of the temple of Baalbec. And these are not the "something like it," of those pretentious and incompetent attempts which in every country make ridiculous the boasters and the parvenus. No. The detail and the finish disclose conscientious study and technical pains. Evidently, the best artist has been chosen. He has had liberty and he has had money. Above all, money. . . . As in the harbor and the streets of New York so much activity con­founds you, in these avenues of Newport so much wealth astounds you. It revolts you or it ravishes you, accordingly as you are nearer to socialism or to snobbery. The disinterested observer who looks at a city as he would look at an ant-hill, recog­nizes there the same fact observed at the first hour, a something intemperate and unbridled. The American genius seems not to know measure. The buildings of utility that these people construct, when they are tall are too tall. Their houses of leisure, when they are refined are too re­fined. When they set themselves to spend­ing money, they must spend too much in order to have the sensation of having spent enough." The uniqueness of Newport, indeed, prevents it from being typical, though it does not prevent it from being highly symptomatic. And, even as to Newport, the generalization of a regardlessness of expense, though obvious, does not proceed from a wide induction. The majority of the summer residents are still cottagers. The "palacers" are few in number, although the palaces are so conspicuous as to be characterizing. 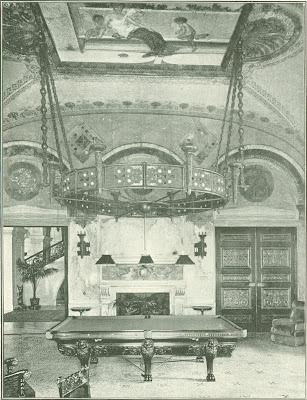 The "Ochre Point Club," invented by local envy, to which the initiation fee is a million dollars, must be strictly a coterie, a very select coterie, and as amusing as one would expect from that particular principle of selection. 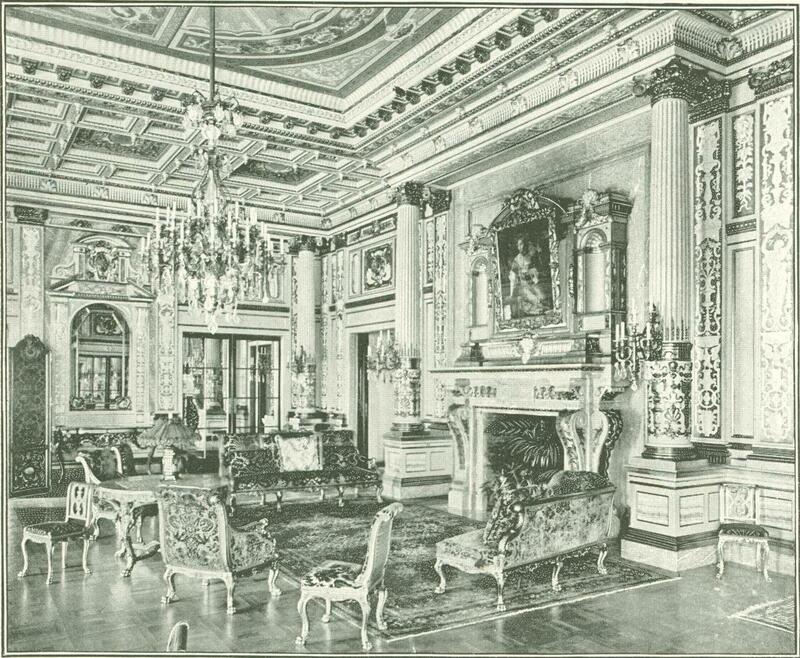 But there is no affectation of humility about such palaces as "Ochre Court" and "Marble House" and "The Breakers." 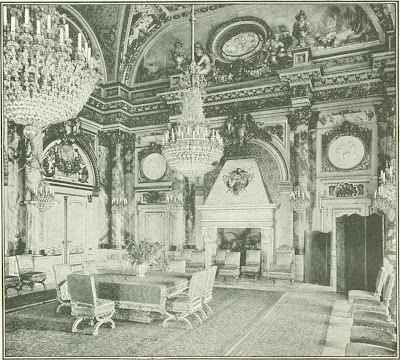 They are palaces confessed, and the most palatial of them is "The Breakers." The three, as it happens, are all from the same hand, that of the late Richard Morris Hunt, and exteriorly, I think that nobody would call "The Breakers" the most artistic. That distinction pretty clearly belongs to "Ochre Court," which is a château, very like the one M. Bourget had in view, and that recalled to him Azay, Chenonceaux and the Loire. The idea of a Roman villa, a "sea-side palace" at Capua, say, in the Imperial period, seems to have been in the minds of the architect and owner of "The Breakers," one of those of which the regardlessness of expense astounded and rather revolted Horace. This idea seems to me to have been much more completely and artistically expressed in Mr. Hunt's first design, which perhaps exists only in the form of a perspective sketch. This was for a pinch lower and simpler building than the actual erection, a pavilion which, with all its sumptuosity, gave the true notion of a sea-side place, a temporary abode, a tent, even though a tent wrought in marble, pitched by the beach for resort rather than for residence. It promised as artistic an expression of this phase of "lordly pleasure-house" as "Ochre Court" is an artistic reproduction of the chateau of the French Renaissance. It is a pity that it could not have been executed, to have added an interesting variant to the types of villas, already to be seen. Why it was not, I do not know. Possibly on account of the need of more "accommodation" than could be obtained in so low a building on so restricted a plat. The de­pendencies and offices of a country-seat, if they are distributed on one or two floors, take up more room than can be spared for a site on the Cliffs at Newport, and accordingly have to be superposed, to the injury of the architectural expression. Even in "Ochre Court" they are assembled in an annex of four stories, and this annex is the chief drawback to the complete success of that admirable work. The assemblage of them in "The Breakers" under one roof with the main apartments, and in a third story and an attic, inevitably gives the building the air of a town mansion - in this case, of a Roman palace in Rome rather than of a Roman villa at Capua. 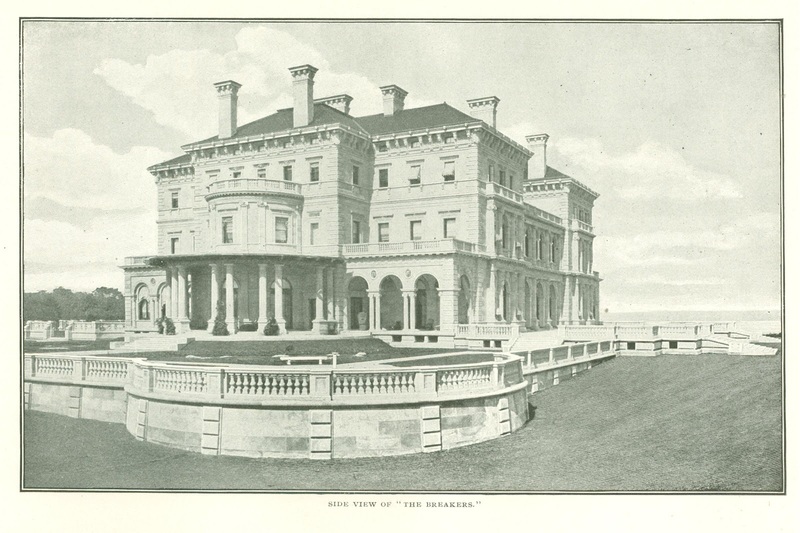 There would be nothing incongruous in the design of "The Breakers" for the town-house of a multimillionaire who can afford himself, as one multimillionaire has lately afforded himself, the luxury of enough grounds for the frame and setting of such a mansion. And to say that is, of course, to say that there is something incongruous in the erec­tion of it as a summer place on the Cliffs at Newport, where it has even an aspect as much "institutional" as domestic, even of domesticity raised to the "palatial" power. In its actual place this great bulk of light limestone has distinctly a "public" air, which all the pains taken with the design and detailing of the features do not suffice to remove. Given the architect's donnee, however, and it must be admitted that it is artistically wrought out. Each of the four "elevations" is separately de­signed and has its own distinctive feature - in one the entrance-porch and driveway; in another the rounded projection of the drawing-room, continued as a bay in the second story, and with the peristyle of Roman Doric columns below flanked by an Italian arcade; in the third the double loggia, filling out at the center through two stories the recess between the projecting wings. Artistically, this front, looking eastward at the sea, is the most suc­cessful and taking of all; and it is so thanks to this central feature. The propor­tions of the loggia are happy, and the transition from the simplicity and massive­ness of the three single lower openings to the elaborate lightness of the doubled openings above is very effective. And from any point of view the building gains greatly from being set upon an "emplacement" which is architecturally a part of it, and of which the walls and terraces and perrons and balustrades help to make up the en­semble as well as to promote the sense of a regardlessness of expense. But it is the interior, as the illustrations show, and as the reality shows much more vividly, in which the sense of lavish expend­iture is carried furthest. It is doubtful whether in any other country-house in the United States what in Europe would be called "the state apartments" are so stately as in this summer home. The feeling that the house is too big for its site is, of course, lost within doors, where the mag­nitude of the rooms becomes evidently necessary to the attainment of a dignified amplitude. The rooms are no bigger than they ought to be to mark the character which the artist had in view. This is, of course, the character of magnificence, and for the expression of it liberality of space, as well as sumptuosity of material, is mere decency. Albeit the photographs give an inadequate sense of it, they give one much more nearly adequate than words could do. The scale is, indeed, unusual in American houses. The great hall, for example, running through two stories, is more than forty feet high, and, of the rooms which open from it, the drawing-room has an area of thirty-two by fifty and the dining-room is somewhat larger. 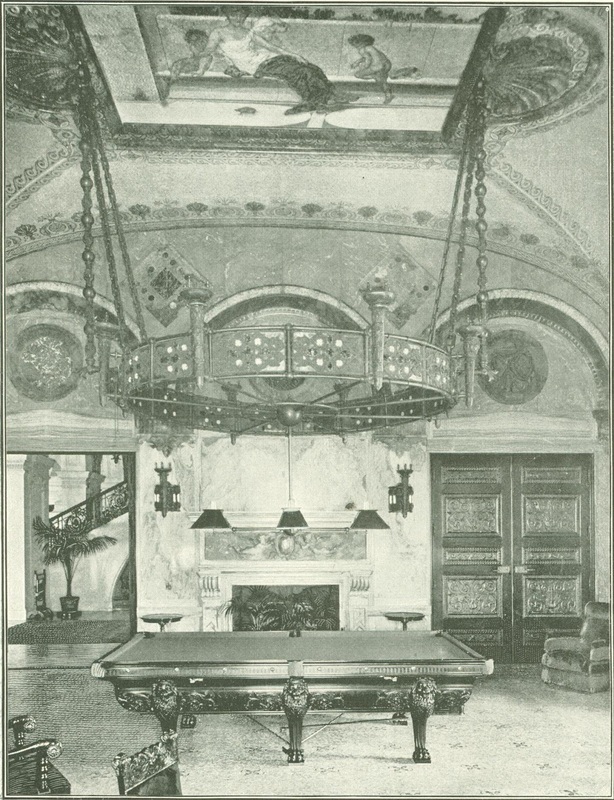 The hall, lined with carved Caen stone, is merely a fitting vesti­bule to the "show-rooms" - the rich and dusky splendor of the billiard-room with its wainscot of serpentine and the mosaic of its domed ceiling; the truly "palatial magnificence" of the dining-room with its massive shafts of red Numidian and their gilded capitals; the gorgeousness of the white-and-gold drawing-room; the arch of the great stairway with its railing of wrought metal, dividing at the landing into the graceful curves of the upper ramps. Of all these sumptuous apartments, the dining-room perhaps gives most powerfully the impression of magnificence, strikes the spectator as the most successful work of art. 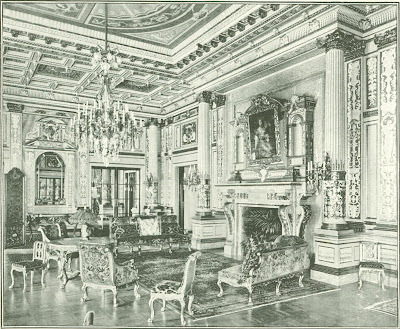 But, except the drawing-room, which is from another hand than the archi­tect's, and in the gorgeousness of which there is perhaps a touch of banality, each of them strikes him as primarily a work of art, and it is this fact which saves any of them from making the effect of mere profusion. Like the scale, the ma­terial is felt to be merely the due execution of the design. Even M. Bourget's phrase, "above all, money, " it would be unjust to apply to this work, much more the phrase of "a luxury a little brutal, " which he applies to some of the manifestations of our plutocracy. One need not leave Newport to find justification of both. There are there apartments and houses which may be said to exhale money, as Cardinal Newman, in a burst of Saxon, said of the common ­room of Oriel, in his time, that it "stank of logic." Where the design, which has been so lavishly carried out, is in itself in­teresting and evidently worthy of so elaborate an execution, the element of vulgarity which belongs to mere profusion vanishes, and the sense of ostentation is replaced by the sense of art. In a work thus simply adequately done, there is not anything "intemperate and unbridled." The owner has not been "spending too much in order to have the sensation of having spent enough"; he has merely been supplying his artist with the means of carrying out the artist's ideas. 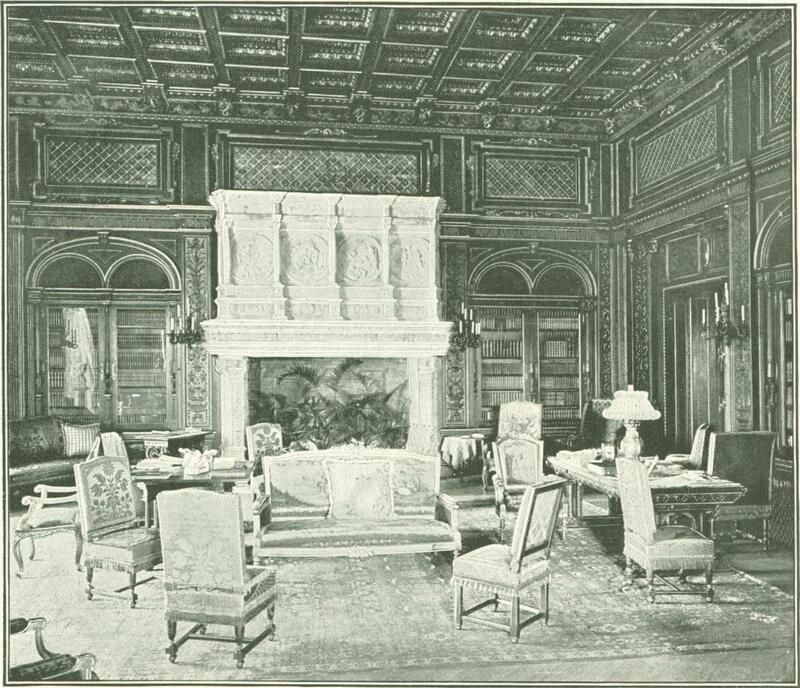 Naturally, a palace built among palaces for an owner who was reputed to be "the richest man in America" would be looked to for an example of profusion and osten­tation. 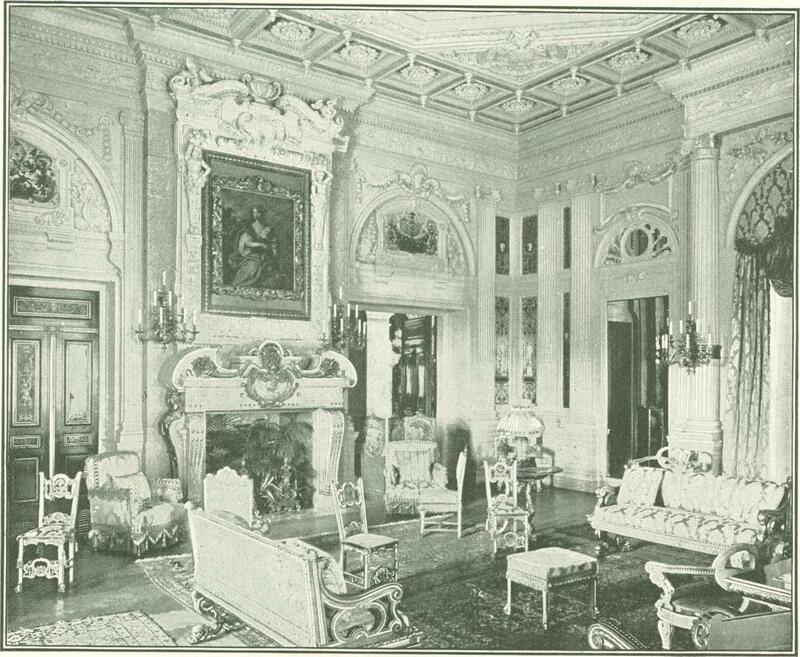 How repugnant it would have been to the modesty and simplicity of Mr. Cor­nelius Vanderbilt's character to set such an example, strikingly appears from one of the rooms in "The Breakers," which is not in the least one of the show-rooms. It is a small room on the ground floor, perhaps the smallest on the floor, very plainly fitted and furnished, a mere "cabinet de travail," which was known as "Mr. Van­derbilt's office," where the master of the house closeted himself with the care's of business and of charity which engrossed his blameless, diligent and useful life. 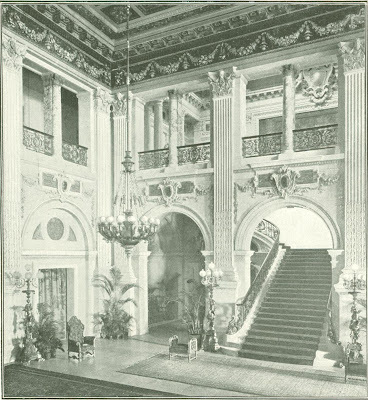 Already, new as they both are, the two most noteworthy palaces of the Cliffs, "The Breakers" and "Ochre Court," are bereaved of their builders, and the universal moral of mortality is "writ large" when death involves a divorce from great posses­sions. It is not alone the palatial character of the villas of Newport - at any rate it is not the palatial character of this particular villa, among the most palatial, that gives the impression of "something intem­perate and unbridled," which undoubtedly one does derive from the aspect of the Cliffs. It is the huddle of palaces, testi­fying to, the queer gregariousness of the plutocrats who occupy them, and who are so devoted to the society of one another that, having enjoyed it in New York all winter, they must welter in it in Newport all summer. Even a multimillionaire, we may concede, has a right to his preferences, but this, the observer is driven to suspect, is not an affair of enjoyment so much as of emulation, the struggle to outdo one another, or at least not to be outdone. And of course there is a taint of vulgarity about this feeling. Wherever it can be detected, it justifies Colonel Waring's re­mark that the victims of it are devoting themselves to "expense, regardless of . pleasure." And certainly the huddle of palaces has an unfortunate effect on the appearance of the palaces. 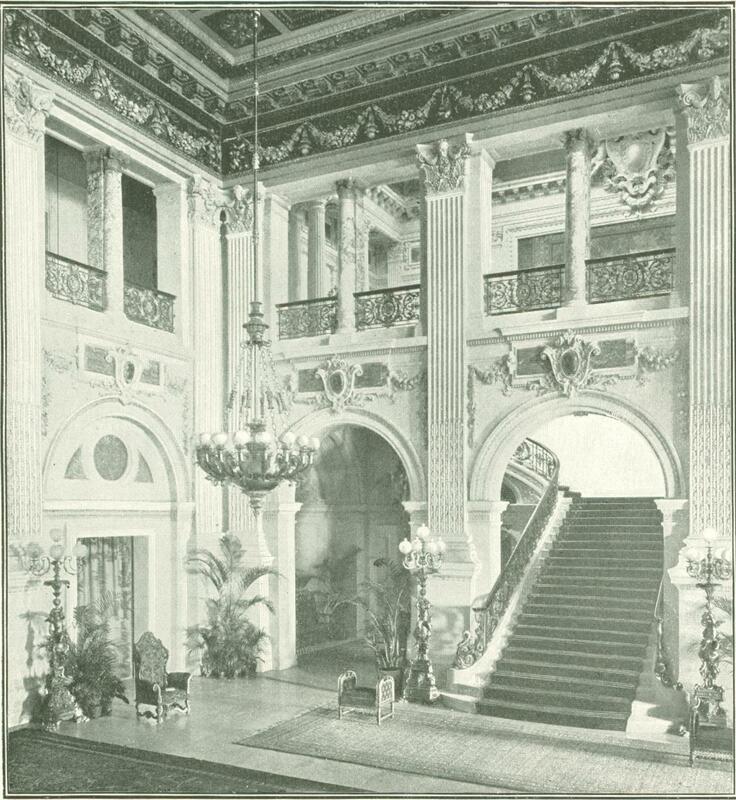 They are so crowded that "The Breakers" has been carried a story higher than its architectural expression required or justified, and that a four-story annex has been added to "Ochre Court." Apart from that, each of these palaces requires a domain for its setting. A palatial villa with only the appendage of kitchen-garden is a misplacement of magnificence. Any one of the Newport palaces might be the show-place of a shire. The least that should be done to enable it to have its due affect, would be to build it in its own park, not its own door-yard, and to keep it out of eyeshot of any other edifice of similar pretensions. Happily some multimillionaires have discovered that a country-seat implies an estate, and in North Carolina, in New England, on Long Island, and elsewhere, have begun to realize that idea. The results will not stun the be­holder with the desperate prodigality which impresses him at Newport. But they will be all the better for that.